Tucked inside one of Rutland’s redeveloping neighborhoods is a rare business that mirrors what’s happening around it — innovatively growing to better serve the community. Lenoci’s Fine Shoe and Leather Repair Shop started 82 years ago after John Lenoci, an Italian cobbler, made his way to Fair Haven then Rutland, working at the city’s State Street Shoe Repair Shop and later, the My Shoe Shop. The family-owned shop was located in the heart of the city’s downtown, bordering the northwest neighborhood. While many of the city’s old institutions downtown faded to black and the neighborhood succumbed to the Depression and the Recession, Lenoci’s was a shining example of a lasting American business built from the ground up. Today, after gaining a partner in longtime ski instructor Dave Goodspeed in 2007, the shop has stuck to its roots – settling even deeper into the Northwest neighborhood on Cleveland Avenue, but using new technology to combine traditions — shoe cobbling and modern-day medicine. “A group test of 35 kids showed no correlation between strong legs and the quality of their turns,” Goodspeed said in a recent interview, describing his discovery that performance among ski racers had less to do with strength and more to do with their hips and feet. Goodspeed was a ski racing coach at Stratton Mountain School, Killington and Pico for more than 25 years and for most of that time questioned his skiers’ performance, naturally. Goodspeed is now one of the state’s only board-certified pedorthists and Lenoci’s, which also encompasses a shoe lab and foot clinic called BalanceWorks, is the only complete foot care center in Central Vermont. The company, now owned by Goodspeed, not only makes and fixes leather shoes and creates special cushions for shoes, it produces handmade lifts and orthotics and has a complete diabetic shoe program. Goodspeed specializes in orthopedics, master boot fitting and shoe fitting. His answer to his skiers’ problems turned out to be the same problems most Americans have– that performance was an afterthought to pain. Through his own studies, Goodspeed determined that the alignment of an athlete’s hips, legs and feet is what makes you good on skis and in balance when walking. 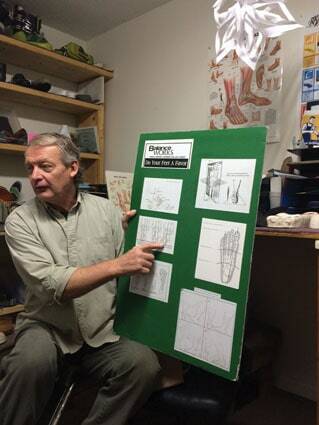 A consultation at Lenoci’s and BalanceWorks starts with an explanation (a science lesson) on how the foot is supposed to work, with correct alignment. Then Goodspeed inspects your feet and determines length and width, but most importantly, how you plant and turn your foot. By hand, he shapes each foot, turning and twisting, putting wedges where more height is needed to get each foot in line with one another and more importantly, in line with the ground. Even the slightest dip inward, called pronation, can effect balance, performance and pain. The straighter and more even the feet, the more area on the base of the foot there is to act as the body’s natural shock absorber. That results in stronger feet, legs and a better push of energy toward the front of the foott, which ultimately results in better performance. In skiers, proper edging can come from proper heel alignment, according to Goodspeed. “If you are not in balance, somehow you are compensating,” resulting in leg, hip and knee injuries among athletes and the elderly, Goodspeed said. Runners who swing their arms too much could be compensating for a problem from the waist down. Most medical doctors don’t have experience with feet or what ultimately causes foot pain – over-pronation. “We treat diabetics mostly but sports has always been my first love…We taught a seminar for female runners and plan to partner with mountain bikers and other athletes. Proper foot care can also prevent overuse injuries,” he said. The center is developing a plan to purchase equipment capable of 3D scanning. That will allow Goodspeed and company to have a lifelong model of each clients’ foot for proper shoemaking or shoe fitting purposes. That new computer software will allow the store to keep that information forever, so a client never has to wonder what shoe works best for them again. Once clients know how their foot performance can be improved through Goodspeed’s modeling, that’s where Gretchen Lima comes in. Lima is also a certified pedorthist and master shoe fitter working at the center. “Most people haven’t had their feet measured in 30 years,” Lima says. Today, shoe retailers don’t measure feet, let alone use that metal Brannock device. Lima measures a client’s heel to toe length, heel to ball length, and width. Lenoci’s Shoe Repair and BalanceWorks are open Monday through Friday from 9 a.m. to 5 p.m. and Saturday from 9 a.m. to 1 p.m. It is located at 79 Cleveland Avenue in Rutland. For more information, call 802-773-1424 or go towww.balanceworks.biz. Cristina Kumka is a correspondent for The Mountian Times, Cristina_kumka@yahoo.com.